UPDATED: Thu., Aug. 30, 2018, 10:11 p.m.
EAST HARTFORD, Conn. – No. 21 UCF has a new coaching staff – and an offense that looks very similar to the one that helped the Knights go undefeated season a year ago. McKenzie Milton threw for 346 yards and tied a career high with five touchdowns as the self-proclaimed defending national champions routed UConn 56-17 on Thursday night to extend the longest winning streak in the nation to 14 games. The reigning American Athletic Conference offensive player of the year completed 24 of 32 passes and ran for another 50 yards on seven carries. Sophomore receiver Tre Nixon, a transfer from Mississippi, caught five passes for 101 yards and scored on plays of 34 and 11 yards. Backup quarterback Darriel Mack Jr. came on in the fourth quarter and broke a 70-yard touchdown run down the left sideline, making him the team’s leading rusher. It was the first game for coach Josh Heupel, who took the reins after Scott Frost left for Nebraska. UConn quarterback David Pindell was a bright spot for the Huskies, throwing for 266 yards and a touchdown and running for another 157 yards and a score. But the Huskies had 30 freshmen and sophomores on their two-deep, and more than a dozen players saw their first live-game action on Thursday night. 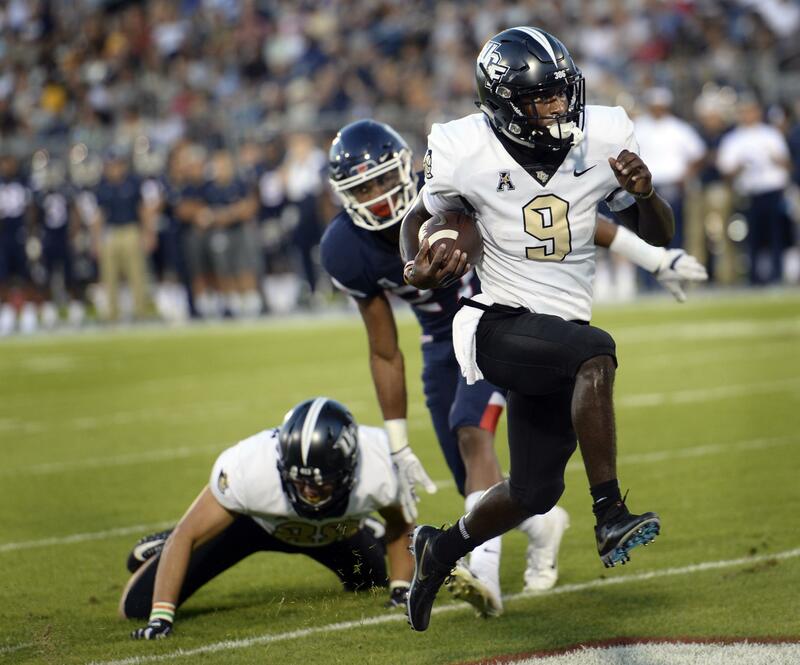 UCF: Heupel’s fast-paced offense is as advertised, putting up 652 yards and scoring eight touchdowns on 11 drives, with each scoring drive taking less than 3 minutes off the clock. UConn: The Huskies seem to have found their quarterback in Pindell. In addition to completing 27 of 41 passes and running 22 times, he had another 50-yard touchdown run called back because of a holding penalty. The Huskies put up 486 yards of offense. The game was marred by what appeared to be a serious injury to UCF defensive back Aaron Robinson on the opening kickoff. The sophomore transfer from Alabama appeared to collide head-first with another UCF player while making the tackle. He had to be cut from his shoulder and was taken off the field on a stretcher, giving the crowd the thumbs-up sign as he was wheeled to an ambulance. Heupel said Robinson is expected to be fine, but will be kept overnight at a local hospital for observation. Heupel said he felt surprisingly calm in his first game as a head coach. The team gave him a game ball in the locker room. “You work for eight months for something and you want it to bear good fruit and tonight it did,” he said. Despite opening with a conference win on the road, UCF’s poll position likely will only be impacted by losses higher up in the rankings. UCF: The Knights head back to Orlando for their home opener next Saturday against South Carolina State. UConn: The Huskies face another ranked team when they travel to Idaho to take on No. 22 Boise State on the blue turf. Published: Aug. 30, 2018, 7:29 p.m. Updated: Aug. 30, 2018, 10:11 p.m.